I remember a friend reacting with shock when he saw the backpack I was bringing for a whole year of traveling in Southeast Asia. “Whoa, that’s it, for a whole year?” he asked, mind blown. It was a fantastic decision that I have zero regrets about. Going carry-on means never having to pay for a checked bag, or losing it to the airline lottery, it also means being able to walk around with your stuff on without suffering under a heavy load, and it’s much easier to keep track of everything when there’s less to keep track of! 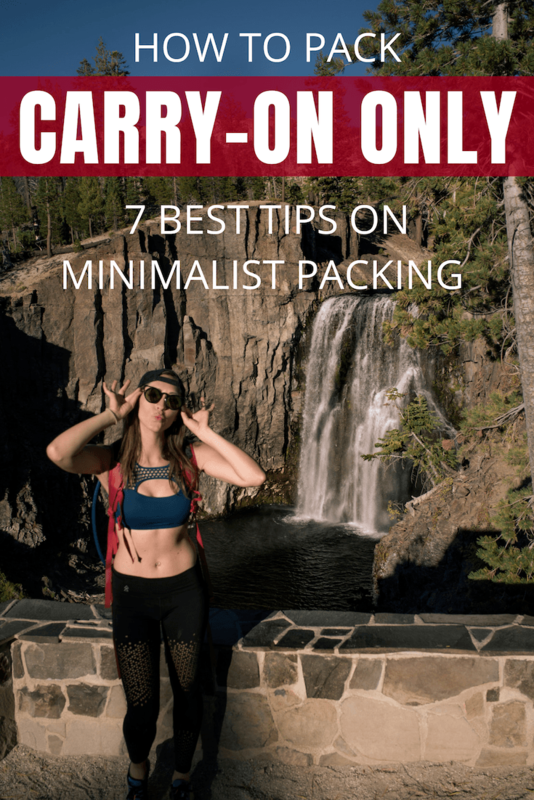 Contrary to what I used to believe, traveling carry-on only does not mean that you have to sacrifice fashion nor does it mean giving up basic necessities. For over half of the time that I’ve been traveling the world, I’ve been able to do it with only a carry-on bag, including in the winter! It just comes down to getting creative and having the right items to make it easier to go the minimalist route. This video details how I fit everything into my bag, followed by additional resources and tips to help you manage to travel carry-on only. Are you ready to save your back? Let’s do this! This is the hard part – evaluating if what you want to bring is really, honestly necessary. Do you really need a hair straightener (honestly no, embrace your natural hair)? Or that much makeup (same thing)? A few select items you’re likely to use just once, or maybe never? If anything in your pile is ‘just in case’ then try to eliminate it. That goes double for products. In general all you need on a daily basis is shampoo, deodorant, soap, conditioner, and moisturizer, right? You can buy new toiletries on the road. Pantene seems to be ubiquitous, as does Dove. The things that aren’t as easy to replace are that special moisturizer that you can only get at home, and Venus razors, so bring that with you. Otherwise, refill on the road! It’s also important to get clear on what prescriptions you can refill on the road and what you should take along with you. This is up to each individual case and isn’t something I can answer for you here, but don’t skimp on must-haves like contacts and prescriptions. This is packing hack for making the carry-on life work. It has two sides – one for dirty clothes and one for clean. I have been using the same packing cube and stuffing it to the brim for the last five years and it barely shows any wear and tear. Though there are plenty of brands out there, I can only wholeheartedly recommend this one from Eagle Creek (affiliate link). REI no longer makes the backpack that I bought five years ago, but their bags are all high-quality. I know because I have abused this one for years on end, so if you have an REI anywhere near you, pop in and try a few on with weight. Though I recommend this Osprey bag on my gear lists because it’s the best alternative, I would much rather that you go and try on a backpack in person than buying through my affiliate link. It’s so important to make sure that it fits your body and that it also feels good when it’s heavy. This thing is going to be your turtle shell, so it’s got to be comfortable! It should fit around your waist comfortably enough that you almost don’t even need to use the shoulder straps. The weight should be distributed evenly on your entire body, and the straps should all be suited to your height and measurements. This is why trying on in person is so important. You may also find that a bag you like without weight feels much different with weight. In general, I think the ones that rest right on your back distribute the weight better, rather than the ‘breathable’ ones with a layer that pushes the bag off of your back (like this, which I would not recommend but am including for reference). Don’t worry about fashion choices. Almost everywhere in the world that I go, I end up wanting to buy clothing while I’m there. It’s generally much better suited to the environment and it’s my favorite kind of souvenir. This isn’t going to be true if you’re going somewhere that is super expensive compared to your home country, but in many cases like in most of Asia, there are really cool local finds to buy. I also periodically exchange clothes with other backpackers I meet on the road so that we can keep our wardrobes fresh. Chances are you’ll meet people who, if you suggest doing a swap, will be happy to because they’ll be equally tired of what they have! Or you can always donate what you have and then buy new stuff. You’re going to save so much money on checked bag fees that buying a new shirt here or there is not going to matter. Shoes take up a lot of space, and my biggest question came down to whether or not running shoes would work for hiking. In places with rocky trails like Alaska or Patagonia, I do think it’s potentially dangerous to wear running shoes. It would also not have been possible for me to go carry-on only there because I needed my bigger pack for hiking the 8-day trails. However in Southeast Asia, and even on the Annapurna circuit, I did my hikes in running shoes and it worked for me, plus allowed me to travel without heavy hiking boots. My daily shoes are flip-flops and they usually do the job just fine! On airplanes and on mountaintops, a jacket is pretty useful. However it can also take up a lot of space. In the case that I really needed something warm, I was usually able to rent it or borrow in Southeast Asia. Otherwise I suggest something small that folds up easily or that you can just clip to the outside of your backpack. A lightweight rain jacket or fleece is perfect. What about going over the weight for your flights? If you have the possibility of doing an online check-in and getting an electronic boarding pass, it’s possible that no one will ever ask to weigh your bag before you board the flight. Of course, it’s important to make sure that you can lift it up and put it in the overhead compartment on your own and that you keep a reasonable amount of weight in it. That said, if it is overweight, wear it on your back when you check in so that it doesn’t arouse as much suspicion and if you do have to check it, take out the valuables and make peace with it. That said, I’ve only had my bag weighed thrice out of five years of traveling. If you want some help on what to pack for wherever it is you plan on going, check out the packing list for everywhere in the world. Whenever possible, I opt to go carry on for the ease of it. I haven’t always been able to make it happen depending on the gear load, but when I have, I’m always so much happier to have less to carry. I can leave the airport when I land without waiting for the baggage carousel to start its dance, I can rest assured that I’ll never arrive anywhere without my stuff, and I know that it’s always with me, safe from thieves. The smaller the bag, the easier it’ll be, trust me! SAME the thing I love the most about it is walking right off the plane and onwards without waiting for the baggage claim. I’m so impatient! Always enjoy seeing your demonstrations of your packing prowess. That Cube is definitely on my list of packing items to purchase, especially after a personal inspection of it. Interesting take on carry-on bags and flights. By being so efficient a packer you are bringing less weight on the plane, possibly saving on fuel (every pound matters! Unless they use the extra cargo space for commercial transport! Still you’re reducing your carbon footprint) consumed during the flight. I just wanted to add to the discussion that I have only on rare occasion been asked to have a carry on weighed (and even then only when I also had something checked). Ideally if you have one bag that is the correct size, but might exceed the weight limit as a carry on, then maybe you can find a way to place it underneath the seat in front of you. I have seen luggage fall out of the overhead bins onto people during the boarding and exiting of the plane and imagine if a flight is really rough, one of those bin covers could open. If the luggage is really heavy someone could get really hurt. . So glad you mention how you give it a shot, but make peace with it if it has to be checked in the end. You are always so reasonable about these things, no need to stress about it. Also it is nice that, while you have your affiliates and give them a call out, you are encouraging people to find their correct fit for backpacks etc. whatever the brand. Very sincere. Lastly, traveling via airplane can be a struggle these days, but seems to be so much easier when solo! I have very few issues with flying when going by myself due greatly to the flexibility I have. Definitely agree that it has to be something that you can lift yourself and that isn’t dangerously heavy! If so then yes under the seat is great. Oh, to add…of course often there is so little room under the seat and have to use the overhead bins. Just making an added suggestion of a possible option or opportunity! I love the carry on only travel lifestyle! It makes carrying all your stuff around and fitting it on trains and busses sooo much easier. I think people forget that there are such things as washing machines on the road. Oh, and also that things can, in fact, be worn more than once, haha! I finally convinced my parents to pack carry on only for our family trip to Italy this year and they were so grateful not to have to lug any giant suitcases down all the tiny cobblestone walkways, and up and down countless sets of stairs! The cobblestone and stairs! Ugh yes that makes it hard in Berlin too. I’m always so grateful when I can go small with my luggage for that very reason there! I live on the top floor of a building with no elevator and that’s how a lot of buildings in Europe are. Thanks for this helpful post! I have a question about packing for carry on when you want to bring items that typically are not allowed in a carry on, for example a razor that you had mentioned being a good idea to pack. How do you get around this? Nobody has ever had a problem with my razors. Hi. How do you deal with photo gear and your day pack? I don’t have a problem with packing clothes in carry-on only. Camera is a different story:D and I have trouble finding the best backpack/sling or whatever. Any recommendations? For a travel backpack, I agree, packs like the Osprey Exos (Eja is the female version) are not ideal, but for wilderness backpacking, there are excellent (and one of the top packs for thru-hiking). We (my partner and I) use a Osprey Tempest 20 and Talon 22 for all travel, including the year long trip we are currently on (southeast Asia 10 months/Europe 2 months). The lack of frame allows the pack to be stuffed into tight places easily. If you need more support, you can fashion a frame out of found material at the destination, and slide it into the hydration pocket, to create a “internal” frame pack. If you are not packing for overnight camping, 20L and 20# worth of gear is all you need to comfortably travel to most of the world, as long as you are not dealing with freezing temperatures. Thanks for sharing! Always good to have multiple perspectives. Just curious how much your full bag weighs. In Europe (and many places outside the US) carry-on is limited to 8 kg. Aside from family vacations, I’ve been traveling carry-on only for over a decade and I find that (due in large part to electronics) that staying under 8 kg is the most challenging part for me. Thanks! I’ve actually rarely had the airline weigh it. I know Ryan Air and some other super cheap ones might, but out of hundreds of flights it’s happened to me just a handful of times.